There are a ton of marketing performance metrics out there, and for many small businesses or those new to advertising, it can often be difficult to discern which metrics matter (and what they mean). 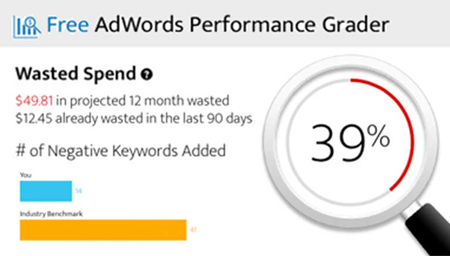 WordStream’s AdWords Performance Grader is a great free tool that helps advertisers make use of all their PPC data, siphoning and filtering through vast quantities of suffocating data and presenting users with the metrics that truly matter. The AdWords Grader packages your key marketing performance metrics into an easy to understand report designed to help you gain insight and take action based on your PPC account data. The AdWords Grader provides deep insight into each of these categories, explaining why these PPC marketing performance metrics are important and how you can take immediate actions to improve your performance in each area. The AdWords Grader has been updated with even more powerful features for tracking marketing performance metrics. Performance Tracker: The new Marketing Performance Metrics Tracker makes it even easier to track the most important marketing performance metrics in your AdWords account. This new feature tracks and analyzes your PPC account every 30 days, providing insight on how your essential marketing performance metrics like Quality Score, conversion rate, and CTR are trending over time. Take Quality Score for example – a metric for measuring marketing performance that PPC experts agree is key to AdWords success. The Performance Tracker lets you monitor changes in your Quality Score and even helps you take action based on your Quality Score trend. Mobile PPC Readiness Score: The Mobile PPC Readiness Score evaluates how well an advertisers’ account is optimized for mobile PPC. Mobile PPC continues to be a growing force in online marketing – are you prepared? New & Improved Benchmarks: WordStream’s AdWords Grader has revisited its competitive benchmarks for marketing performance metrics to ensure that it’s providing only the latest and most up-to-date info. Inconsistency: Only 1% of small business advertisers log in and work on their AdWords accounts every week. Research shows that the more active a PPC account is, the better it performs. Don’t abandon your PPC account to auto-pilot unless you want to see it crash. Wasteful Spending: 1 out of 5 of small businesses aren’t implementing negative keywords into their account. Negative keywords are a huge asset for trimming the fat and preventing wasted spent due to irrelevant clicks. Many marketers treat negative keywords as optional when they are in fact essential. Improper Account Setup: More than half of small businesses aren’t turning on conversion tracking, which makes it impossible for them to see how their keywords and PPC performance leads to sales. Without conversion tracking you’re flying blind! Don’t fall into the same danger zone – try the AdWords Grader Plus today!